"Walking back to Vincent Square with Tam Dalyell on a lovely clear morning we discussed the effect on the Party of getting the "Buggers' Bill" through. It may well be twenty years ahead of public opinion; certainly it's upset traditional members in the north who jeer their Members and send them bullying letters. It might be the right thing to do, but has gone down very badly that the Labour Party should be associated with such a bill. "Why are you worried about the buggers at Westminster when you should be worried about unemployment at home? they ask." As I wrote the other day, Plus ça change, plus c'est la même chose. Well done to Tom and his hard-working ward colleagues, Andy Allison and David Trice. It was the Chatham & Aylesford Management Committee this afternoon - my third Management Meeting in a week. My thanks to Adrian and Pat Gulvin for allowing use of their home and providing lunch for 12 people! I am very fond of Chatham & Aylesford. It was where Steve and I settled when we first moved to Kent 11 years ago and where I re-joined "active political service". As a voluntary member I was soon elected Deputy Chairman Political. I chaired the 2005 Parliamentary Selection (the Association Chairman was an applicant so could not participate). It was in the early years we rebuilt the team who have stuck together for the last decade and achieved so much. When we began, C&A had just 3 Conservative councillors and a Labour MP; now it has 23 Conservative Councillors and a Conservative MP. The real reason I am fond of C&A is it is totally focused on what really matters. 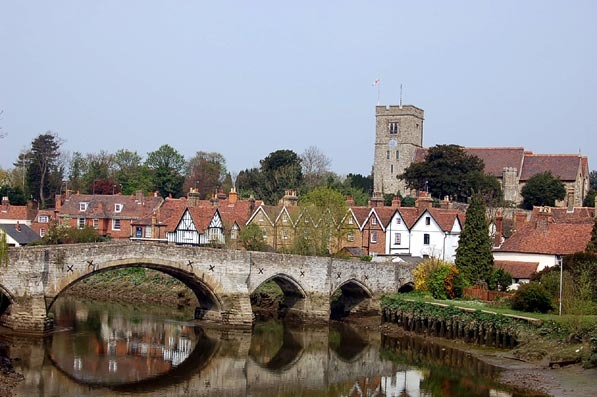 The Association has the smallest membership in Kent (the two halves - "Chatham" and "Aylesford" being the Cinderella rumps of two previously strong Conservative seats, brought together against everyone's wishes by the Boundary Commissioners in 1997). The constituency is divided; geographically by the North Downs, politically by two different local authorities, economically between the proudly blue collar areas of Chatham and semi rural Maidstone suburbia, and economically, too. The average household income in Chatham being 30% less than that in Aylesford. Yet despite these inherent fault lines, C&A continues to punch above it's weight. In the three years leading to the 2010 General Election they delivered one million leaflets (that's an average of 25 per household!) By polling day we had knocked on every door three times and had built up the largest pledge base in Kent. 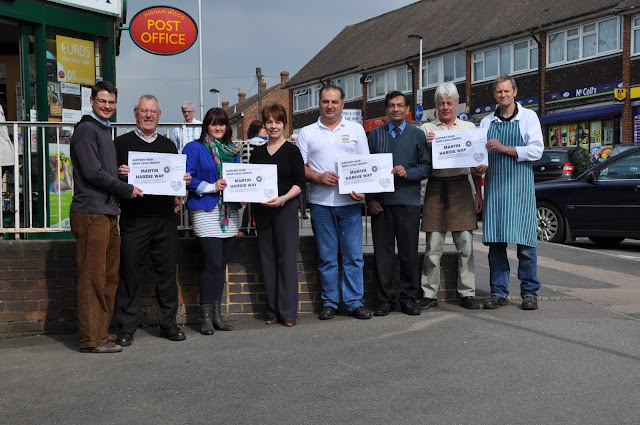 We had enrolled more postal voters as a % of pledges than any other constituency in the South East, and we were able to turn out canvassing teams of between 8 - 20 people every Saturday for three years. Even in these more difficult times, C&A continues to outperform many numerically stronger Associations. 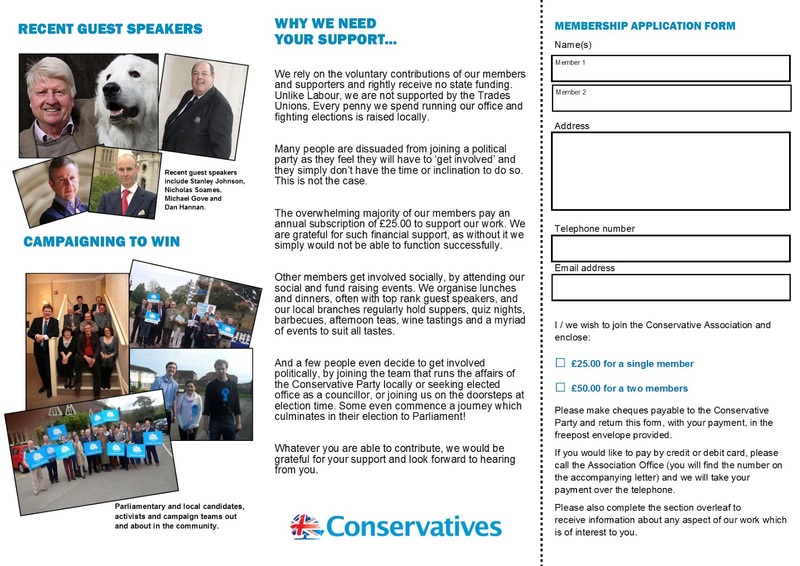 It raises enough funds campaign effectively, pay a share of the West Kent Campaign HQ establishment and wage costs, pay everything due to CCHQ and still make a small surplus. Where many areas complain about inability to deliver a single election leaflet or run an effective GOTV, in C&A they rise to meet every challenge they are given. If I explain that we need four full deliveries to retain our council seats, they will find the time, energy and inner resolve to deliver them, and still meet their local government, business and family commitments (though I know the sacrifices many of their families make during campaign periods). Even after working with them for ten years, I find their commitment inspirational. Unlike so many Associations, there are no egos, no prima donnas and no vanity. It is very rare (in fact it is happened just once in ten years) for a candidate in 'safe' or 'unwinnable' seat to insist on working their own wards when asked to transfer their resources to a neighbouring battleground. It is this collective teamwork, respect and trust which has enabled us to win and retain council seats which have not been Conservative for 40 years. Today's meeting saw no splits, complaints or faint hearts. Yes, some may well have reservations about certain aspects of coalition policy, but they know the only alternative to a Conservative government in 2015 is a Labour one led by Ed Milliband. I wish there were more Chatham & Aylesfords. 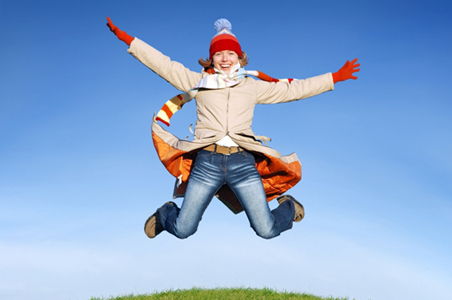 Going for Growth - now is not the time to retrench! I have been around long enough to see our fortunes ebb and flow. I was an agent during the introduction (and demise) of the Community Charge, when banner waiving protesters barricaded my office (with me inside), and what appeared to be a perfectly rational old lady became so incensed with the perceived injustice she padlocked herself to my desk whilst reading aloud sections of the Magna Carta, which she believed exempted her from having to pay. I was around for the downfall of Mrs Thatcher; my goodness - if you think people are angry now, you should have heard them then! And for the Anglo-Irish Agreement, when Unionists were so outraged about any form of power sharing with terrorists that they resigned in droves. I recall one particular local election count where over 100 ballot papers were rejected as the words "ULSTER SAYS NO" had been written across them. Then we had Black Wednesday and our expulsion from the ERM, and the Social Chapter vote and withdrawal of the Whip from the Maastrict Rebels. Each of these events brought outraged letters of resignation from members and supporters who genuinely felt betrayed by events they could not support. I have never doubted the sincerity of those who feel so let down they have to resign, though I am saddened that some make decisions based on an emotional rather than a rational response. Longevity has taught me never to try and persuade someone from resigning if that's what they want to do. It has also taught me that the overwhelming majority of those who support change remain silent, whilst the opponents shout loudest and longest. At difficult times like these there is always a temptation to retrench. I am pleased that I work for three Associations who take the opposite view. These are the times when we come out fighting; behind the noise of the angry people are a quiet majority who not only understand why difficult decisions are being taken, but in their heart support the type of fairer, more just and inclusive society we are trying to achieve. This is the time we must reach out to these people and invite them in. Over the last week two of my three Associations have held meetings of their Management Committees, and each have made brave, radical and far reaching decisions. 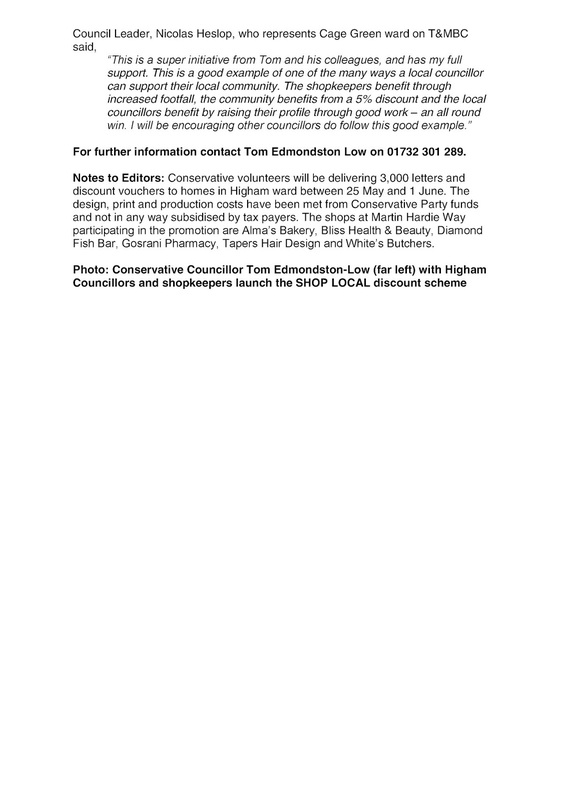 In the summer, Tonbridge & Malling and Tunbridge Wells will be joining forces to run a series of high profile full page adverts in local newspapers, with accompanying mailshots to hundreds of local voluntary groups and organisations, inviting people to attend an informal seminar on how to become a Conservative local government candidate. We are determined to deepen the pool in which we fish for our candidates and show the wider community that we are open, inclusive and willing reach out to them. And tonight, Tonbridge & Malling voted unanimously to launch a recruitment campaign targeting 18,000 known Conservative pledges, based on a once in 40 year opportunity to help us select a new Parliamentary candidate. How in these tough times can we afford to do this ? Because three years ago, our local Associations swallowed hard and accepted that it was no longer necessary or practical to pay rent and service charges on three building, three lots of business rates, three part time secretaries, three sets of utility bills and three leases on risograph machines. By pooling resources and sharing back office facilities, we have released £20,000 per anum to spent on campaigning and development - which is exactly what our members and supporters donate their hard earned cash to pay for. I have used my break to read a number of books and articles which I have had on my pending list for too long. Ruth Winstone's Event's, Dear Boy, Events is a wonderful compendium of 20th Century social and political diarists, printed chronologically to provide the reader with a snapshot of political commentary. It begins on 30 January 1921 with an entry from Cabinet Secretary Thomas Jones about being invited to dine at 10 Downing Street and to sing Welsh hymns for David Lloyd George and concludes with our very own Iain Dale writing on Wednesday12 May 2010, "I am basking in the warm afterglow of yesterday, but the press conference taking place at the moment if going incredibly well. Cameron and Clegg seem totally at ease with each other..."
The Editor, Ruth Winstone - who also edited the Tony Benn Diaries and those of Chris Mullen, started and ended her book when she did as "the Con-Lib government which materialised in May 2010 was a mirror-image of the last Lib-Con coalition of 1918." The arguments throughout the book brought home something I have believed for a long time; almost everything in life if cyclical. Wait long enough and it is almost inevitable that the same issues will come around again - it's just the players on the stage who change. I was amused whilst digging around in the attic at 91 High Street to find Sir John Stanley's original election address - in it he was campaigning for a solution to Aylesford flooding, for better train services to Cannon Street and for a solution to the traffic problems in Tonbridge. Plus ça change, plus c'est la même chose. Is there really that much difference between previous attempts for governments to control monetary policy? Does the Gold Standard and the Bretton Woods Agreement really differ that much from the Single Currency? The Great Depression and Hunger Marchers that different to the riots in Greece? Was the fear and intolerance which led to Mosley's East End riots akin to the rise of the BNP a few years ago? One thing which has struck me of late is a new level of anger from people I know who have never before expressed a single political sentiment. For example my hairdresser, who I have been visiting for ten years, has never voted in her life. Yet she has suddenly started posting "send them back" and "Britain's full, close the doors" on her Facebook page. Another old friend from Hampshire, who has held a view that we are "all as bad as each other" for the 25 years I have known him, has now not only joined UKIP but is training to be a county organiser. The one thing which struck me throughout reading these political diaries is how, time and again, various pressure groups broke onto the political stage and claimed their 15 minutes of fame, but just as interestingly how, through a mixture of usurping their language and incorporating their concerns, the establishment was able to bring them back into the political mainstream. The biggest difference between now and then is fading political identity. For much of the 20th century 90% of voters identified as Conservative or Labour. My maternal grandparents didn't have two brass farthings; he was a dock worker and she worked in a cotton mill, yet the never waivered in their support for the Conservative Party. Why? Because they were Protestants and monarchists and could simply vote no other way. How we bring people back into the mainstream when they have never been part of it is going to be a greater challenge. In case you think I have fallen off the boat and being swept off to Antwerp on a spring tide, I thought I would let you that there will be little blogging until Monday, as Steve and I are taking a few days holiday. Until last night we weren't sure if we would head out onto the Thames or inland up the Medway. However, this morning's weather forecast of high winds and swell on the Thames Estuary (and the prospect of Gravesend at the end of a long day's cruising) have put us off. So instead we are heading upriver. Seems odd to take a holiday to Tonbridge (head of the navigation) as that's where I work, but as I mentioned to someone yesterday "when you are on the water, it's the journey not the destination." We have never navigated the Upper Medway (apart from a brief trip to Wateringbury on a hire boat) so I am looking forward to it greatly. It will be strange seeing towns and villages I know so well from a different aspect, particularly traveling through Aylesford village and under that wonderful bridge. I might give three long blasts on the siren as I pass Aylesford to make sure Tracey Crouch is awake ! Yesterday evening I met with the new Deputy Chairman and Vice Chairman of the Tunbridge Wells Conservative Association, who between them have specific responsibility for Association-wide fund raising. And what a productive and positive meeting it was. The people concerned are the Bulletts (Judith and Alexine) - a Mother and Daughter double act. Judith is Deputy Chairman Membership & Fundraising and Alexine is Vice Chairman Fund Raising. We have constituted Tunbridge Wells so each of the Deputy Chairmen has two 'assistants' as the roles are simply too wide ranging for one person to cover effectively. It works well. The meeting was wonderful because for the first time in a long time, I wasn't making the running. OK, it's my job to suggest, encourage, empower, cajole and, when necessary, take the lead if others are unable or unwilling to do so. But it's not often that I meet people whose enthusiasm and vision is such that I am the one running to catch up. It was not only refreshing but also invigorating! I got the impression that Judith was a bit nervous about how I would react, as she was suggesting changes to things I had introduced and which worked reasonably well. I think, much to her surprise, I not only accepted her changes but positively welcomed them. 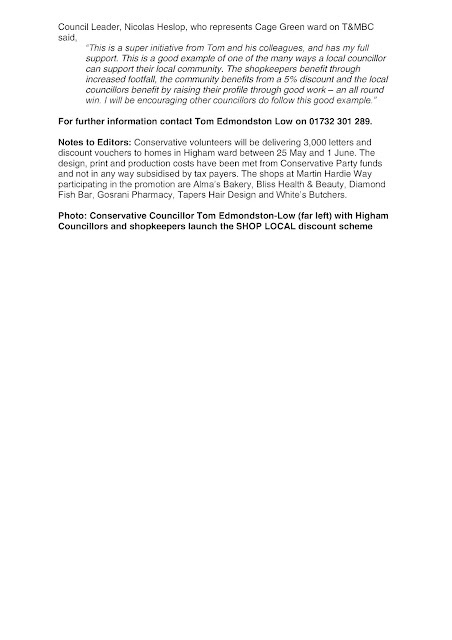 One of the reasons I always throw away the designs for election leaflets after an election is I genuinely believe that the following year's can be better, and I don't ever want to stand still and rely on doing what I had done previously This is as true for the annual dinner and the Christmas bazaar as it is for campaigning and design. They're not planning anything outrageous or financially risky; just bigger and more ambitious. It's all about expectation and aspiration, and if Tunbridge Wells cannot pull it off, where can? So a big thank you to the Bulletts. Let's hope they don't shoot the messenger! 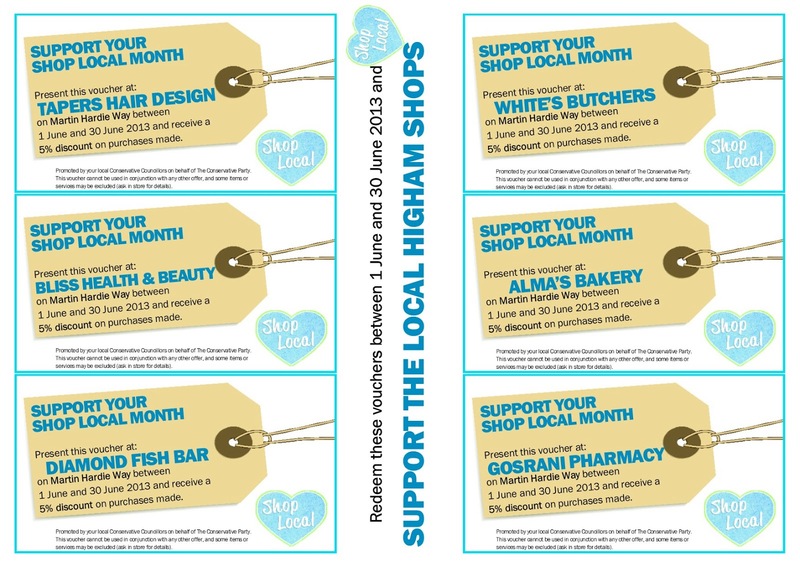 Well, the leaflets are now printed and being delivered, and last Saturday the ward councillors gathered at the shops to have promotional photographs taken with the participating shopkeepers, for the news release. Copies below. Excuse me! I know it's unconventional but I have to make a point! 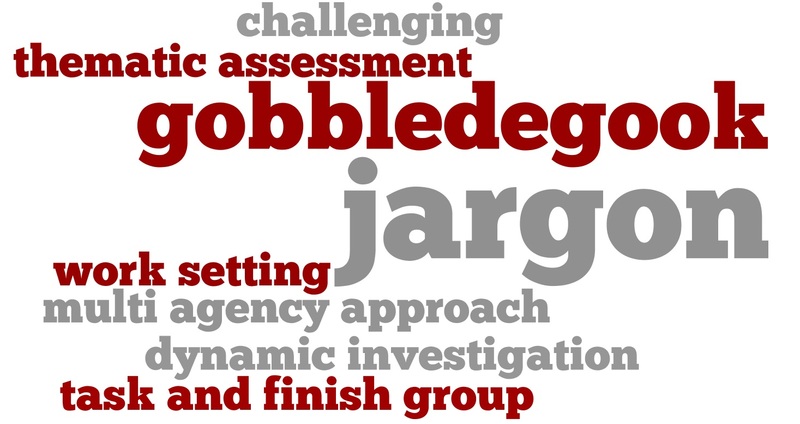 Part two of my review of the SE Region European Selection Conference. Back inside having eaten our packed lunch by the lake, there was an ugly mood. Suddenly someone who looked as if she hadn't missed a lunch in her lifetime had commandeered the microphone. "Excuse me! I know it's unconventional but I have to make a point". Apparently the food was appalling. £10 for three plain crisps and an under cooked chicken drumstick was an insult to the voluntary party. We should all demand our money back - and what's more, we should write to the Regional Chairman with copies our MP and the Prime Minister! There was a murmur of support. Up jumped the Regional Chairman. He was clearly nervous at having to explain how the leader of the Conservative MEPs had been deselected on his watch without having to deal with 100 letters to the PM complaining about the lack vol-au-vents. Apparently 120 lunches were paid for and 120 were ordered. If there wasn't enough food, it was nothing to do with the ordering. The implication was clear - perhaps those at the front of the queue had taken more than their fair share! By the look of the baying mob I suspect they often did. Little did we know that hers would be the most impassioned speech we were to hear for the rest of the day. The Chairman of Tunbridge Wells suggested a game of Euro Lingo Bingo - and we produced a list of phrases to "tick off" as the aspirants read their speeches. It kept us awake if not entertained. One applicant could barely be seen over the lectern and spoke so quietly,could barely be heard. Another so loudly and from such a right wing script it was like being harangued by a Daily Mail reading version of Alexi Sayle. The speeches droned on - QMV, Single European Act, Opt Out, referendum, renegotiation, 2017, Single Market, in, out, when the time is right, Margaret Thatcher - we ticked off the Euro Lingo Bingo words as fast as they came. Interestingly, every single applicant, including the four incumbents, name-checked The Lady at least once. Even after her funeral, her memory dominates and shapes our views. After each speech there were set questions from the Regional Chairman. "On a scale of 1 to 100, where 1 = immediate withdrawal, 100 = greater integration and 50 = the status quo, where do you stand?" asked Andrew Sharpe. All we wanted was a number, any number. Only one applicant managed to give us one without adding a page of justification. He got my vote for brevity, even though his number was higher than I had hoped. One applicant spoke for 4 minutes 18 seconds (we timed her) when she could have said "64". She'll fit in well in Strasburg. It was like listening to a parade of I Speak Your Weight machines translating the collected work of Solzhenitsyn. "Right", announced the Chairman, cheerfully. "Thank God, we've finished" I thought, but no, it was time for a tea break - we were only half way through. On and on it went. Ear trumpet man had glazed over and was probably grateful for his deafness, the lady who had spent the day knitting a powder blue baby grow had run out of wool. A chap walked through with a trolley laden with clanking silver trophies, - I thought they were prizes for those still awake, but they were for the Cha Cha Cha contestants in the adjoining room. Suddenly I was aware of a low hissing sound, apparently the man at the lectern said he would never vote to leave. "That's buggered his chances" I thought, and I was right. I allowed my mind to wander onto long summer days on the Upper Thames, drinking Assam and eating Raymond Blanc's pear and frangipane tarts, then all around me people were clapping, so I clapped too. "Why are we clapping?" I asked Chris Buckwell. "I haven't got a clue, I saw Andrew Mackness was clapping so I thought I should join in." I wondered if the entire room was clapping for no reason. Then it really was all over. Julian Walden was on his feet and explaining the balloting system. He used the phrase, "I have spoken to Alan Mabbutt who has confirmed..." which is code for "so don't ask stupid questions as the rules won't change." The words "Alan Mabbutt" have that effect on us. Apparently there were ten candidates and we had to choose eight. "Who should I vote for?" asked Allan Sullivan, sitting next to me. "It's so much easier when he prints the ballot papers with the Xs already on them", said William Rutherford, much to the amusement of everyone around me. Having positioned ourselves directly alongside the table next to the ballot box we were able to vote and leave before the applause following the vote of thanks had died down. "Aren't you hanging around for the result?" asked Regional Deputy Chairman, Jim Flemming. "Do you mind if I don't, Jim, one can have too much excitement in a day"
A day of my life I shall never see again ! Sandwiched between the security-gated mock Tudor mansions of the Camberley nouveaux riches and the Basingstoke Canal is the Lakeside Entertainment Complex. Like much of Surrey, Lakeside consists of a number of utilitarian buildings of little architectural merit. There's a gym, two hotels, various sporting venues for pool, golf, squash and snooker, a mobile home park, Beepeys Nightclub and the building which hosts the annual World Darts Championship. And there's also the Lakeside County Club, specialising in Asian Weddings, Ladies' Nights (of the Chippendale rather than Masonic variety) and, for today, the South East Regional Conservatives European Selection Conference. In the adjoining building they were hosting the Surrey Latin American Dance Competition. This explained the signs "the use of spray tan is strictly forbidden" and the occasional appearance of nubile young couples in figure hugging outfits, who offered a welcome distraction as the day wore on. Never before have so many people gathered to select candidates for a Parliament they wished did not exist, nor candidates apply for selection on the promise that they would vote themselves out of a job as soon as they could. It was akin to a meeting of atheist vegetarians selecting turkeys which then looked forward to Christmas. We gathered at 9am. The collective sight of the Party faithful on a weekday is fine, as most wear business suits or Harris Tweed. Saturdays however, are something to behold. Out come those special garments saved for such occasions; all manner of cravats, blazers, stay-pressed slacks in various shades of grey and striped jackets of a type which can only be found in the High Streets of Marlow and Henley. One chap had an ear trumpet and kept shouting for people to "speak up", which did make me wonder why deaf people always sit at the back then complain they cannot hear! First up were the incumbents, Richard Ashworth, Nirj Deva, Dan Hannan and Marta Andreasen (in that order). Incumbents receive special treatment; provided they receive support from 60% of those present and entitled to vote, they are guaranteed one of the top places on the Regional List. I wasn't going to talk about the result in this blog, but as a fairly comprehensive report has already appeared on ConHome, I will confirm that neither Richard nor Marta Andreasen reached that threshold. I feel very sorry for Richard. We are on totally opposite sides of the European debate, but he was a decent, dedicated and hard working MEP and was unstinting in his support for the three Kent Associations I work for. He does not deserve some of the nasty and vitriolic comments posted on ConHome celebrating his failure. Given the announcement was delayed due to a recount, the result was clearly very close and I suspect he failed by a handful of votes. I have little doubt that the "swivel-eyed loones" comment resulted in a backlash against those seen as "establishment" candidates, and probably swung sufficient votes to make a difference. Something for those who make such comments to consider before making them again. Nirj spoke well and his speech was by far the most amusing with some lovely self deprecating one-liners, including that he had once been voted "most popular MEP, "though I suspect that won't do me any favours in here" and, "I have been told that I can punch above my weight, which is quite a claim when you re the size I am." Finally it was UKIP defector, Marta Andreasen. Marta was very helpful to us in West Kent during the recent County Council campaign. She joined us canvassing several times and wrote a very useful article on why she left UKIP, which was helpful in minimising defections of Conservative pledges, (though memories of her on her hands and knees on Tonbridge doorstep shouting through a letterbox, "I am looking for two Cox", will remain with me for a long time. Despite handling some hostile questions adequately, I sensed she was not connecting with many of those in the audience and was not surprised when she also failed to reach the threshold. And that, readers, is the morning session. I will blog later about the peasants revolt over the chicken drumsticks and the joys that came later. Reliving it is better than watching the Eurovision Song Contest (though only marginally so). A little tender what? I hear you ask. "Nautical A vessel attendant on other larger vessels, especially one that ferries people or supplies between ship and shore, or into waters too shallow for the larger vessel to navigate." After a few false starts, we finally shook hands on a deal this morning. The seller is a lovely old chap who has been using her for years, but has recently found advancing age is making it difficult for him to navigate. Before buying this one, we had considered a few others. One of the oddest viewings was of a lovely looking boat in Little Venice Marina at Yalding. The photographs on Ebay showed a delightful, well maintained and much loved boat with lots of polished teak and brass. When we got there, the actual boat was a completely different make and model to the one advertised; with pools of stagnant water in the cabin and strewn with beer cans and signs of advanced osmosis. The woman selling it was equally odd. She spoke with a heavy eastern European accent, like Zsa Zsa Gabor's country cousin, and refused to meet us as, "in my country ve neva do bizeness in ze morning". Perhaps she was Transylvanian? We had to collect the keys at 10.00am from a woman named Sally, whose name wasn't Sally, but Caroline. Sally (or Caroline) worked at the marina, but she had never met Zsa Zsa Gabor either. Her monthly mooring fee was always pushed through the letterbox in cash, and at night. Just as we stepped on the boat Zsa Zsa rang. "How do you like my little boat" she asked. It was spooky, as if she was hiding in the woodland watching us. "It's appalling, we wouldn't have it if you were giving it away and you should be done for false advertising", I ranted. "How about if I knock £1000 off the price?" Considering she was only asking £2,000, this was quite a reduction, but still we weren't tempted. "In zat case, pleaze hand ze key back Zally." "Her name isn't Sally, its Caroline..." Click - by this time Zsa Zsa had returned to her vault. So now, we are a two-boat family. She isn't glamorous and she has very little style, but she will do exactly what we want her to - transport us up and down the Medway, on day and weekend trips away. 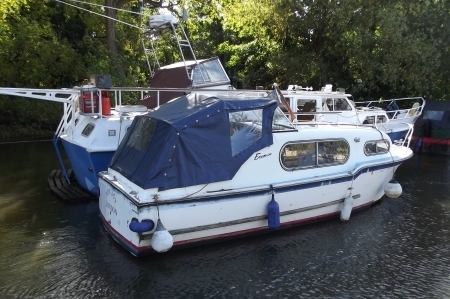 She has a powerful outboard motor, able to punch against the strongest tide, a cosy little forward cabin which converts into a double berth, a two ring cooker, fresh water supply and loo. Soon we'll be running day trips to Snodland, Strood, Gillingham and the Isle of Sheppey. Form an orderly queue, please. We might be at a low point of the political cycle, but I have never believed this should be used as an excuse for standing still. At the County Council elections, our three strongest performances each saw the Conservative vote share decline by just 3% - 4% compared with 2009, and in each of these wards our local teams delivered between 5 - 7 leaflets. Whereas our three weakest performances (where the vote fell by 15%+) saw just two leaflets. I have never seen clearer evidence actions leading to outcome. 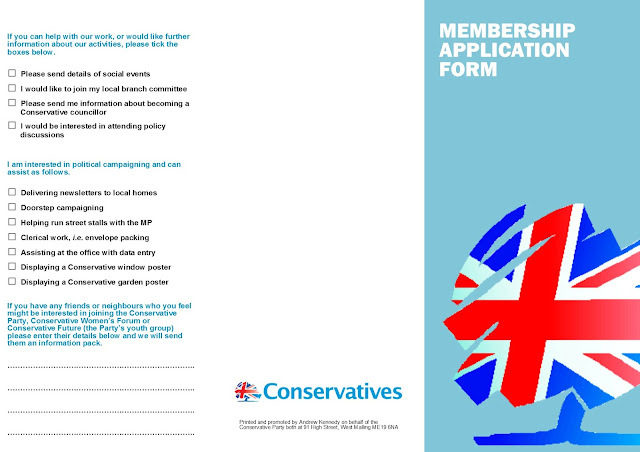 Similarly with membership recruitment. Yes, it's tough, but we need to see the opportunities and not be discouraged by the apparent gloom (or perhaps I should say, not use the gloom as a reason for doing nothing!) We are presently polling around 31% compared with 37% at the General Election. What this actually means is for every 100 people who voted for us at the General Election, 83 of them are still with us. But more importantly, given where we are politically, clearly those 83 are loyal, and supportive of what we have achieved. So rather than using the missing 17% as a reason for doing nothing, shouldn't we be identifying the 83% and asking them to join us? Our County Council canvassing demonstrated that those who are still with us are determinedly so; had they been tempted by UKIP they would have gone by now, and the one thing which absolutely unites them is a determination to prevent Ed Miliband and Ed Balls from running the country. So that's just what we are doing in Tonbridge & Malling. In June we will be running our largest recruitment campaign for a decade. All that has to be decided is the scale - either 5,000, 10,000 or 20,000 targets. I suspect we will settle on 10,000, but that's one of the decisions next week's Management Committee must take. The recruitment will be linked to Sir John Stanley's retirement and the prospect of participating in the selection of the new Parliamentary candidate, something the Association has not done for 40 years. Here is the new recruitment leaflet and form which we will send with the letter. I have spent quite some time today trying to find the right words to overcome the main objection to joining; fear of the expectation that if they join they will have to 'get involved'. As always, I am happy to share my work and if you think what I have produced would be helpful to you locally, please feel free to copy my ideas. More Leaflets really does = more votes! More leaflets = more votes! I first heard this irritating but accurate one-liner from Gavin Barwell, when he was Campaign Director at CCHQ. My colleague, Chris Scott, also recites the mantra, as do I. Now I have proof. Over the last few days, along with my 'resident statistician' Dr John Hayward, we have been number crunching the Kent and SE Regional voting figures from 2 May - and particularly within the three constituencies where I am agent. We have charted and cross referenced votes by Division over the last four years, and cross tabulated them against individual ward / divisional and candidate's campaign actions. Without divulging specifics I can now say that "More Leaflets = More Votes" is true (not that I personally ever doubted it). Over the 14 County Council Divisions where I was agent, there is a direct and clear correlation between the number of 'points of contact' with an elector and the size of the swing. I have always been frustrated at candidates who claim "it makes no difference", or whenever I hear the tired words "if we do too much it will irritate people". Almost always those making such comments haven't knocked on a door or delivered a leaflet for a decade! What is absolutely clear is despite the national tide in UKIPs favour and a number of issues testing the loyalty of the traditional wing of the Conservative Party; where a local candidate had a high profile doorstep based campaign, they were easily able to see off the threat. By way of example; in our three top performing Divisions, the Conservative vote share (%) fell by less that 5% (and this is compared with 2009, which was a record year for us). In our worst three Divisions, the Conservative share fell by more than 15%. And can I share something else ? In the top tranche, our local teams had 3 x the number of contacts with voters as the bottom tranche. So next time you hear a laissez faire candidate or branch Chairman claim "campaigning makes no difference" - tell them they are wrong! 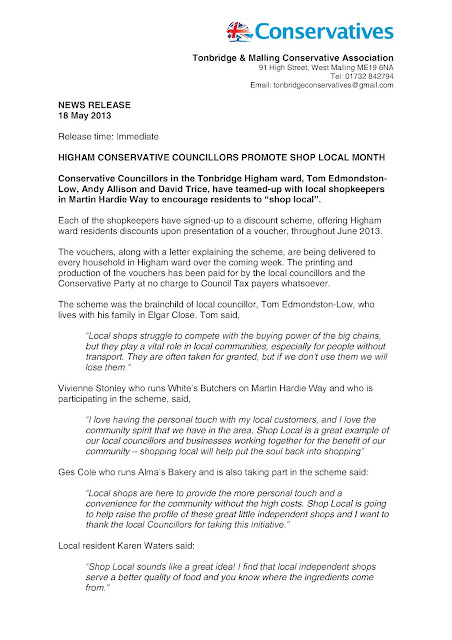 I wanted to highlight this excellent initiative by one of our local Conservative Councillors in Tonbridge and Malling, Tom Edmondston-Low, who represents Higham ward. Tom is a great supporter of his local shops and businesses, and he picked up a suggestion from the Conservative Councillors' Association (CCA) to run 'local shops promotion'. 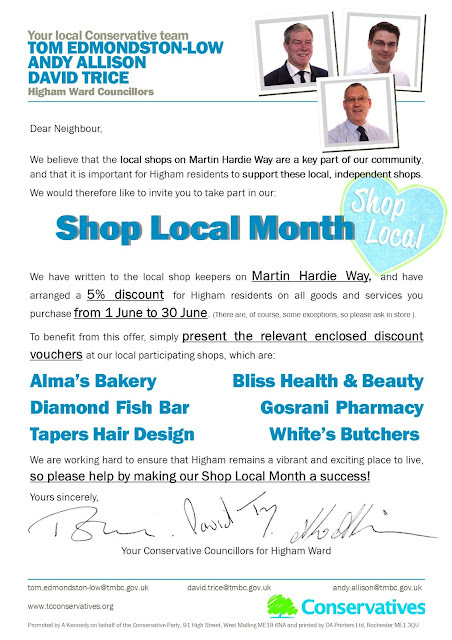 Tom visited the parade of shops serving his community and signed them up to offer a 5% discount to all customers in possession of a discount voucher, between 1 June - 30 June 2013. 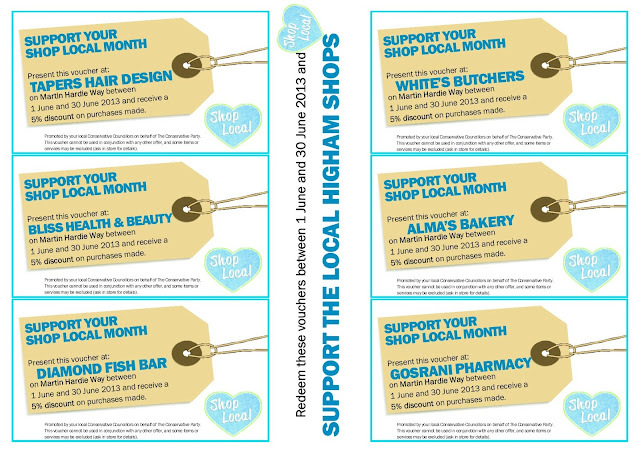 He then designed the attached leaflet, with an explanation of the promotion on the front, and various money-off vouchers on the reverse, which, along with his colleagues, will be delivered to the 3,000 houses in his ward over the coming week. 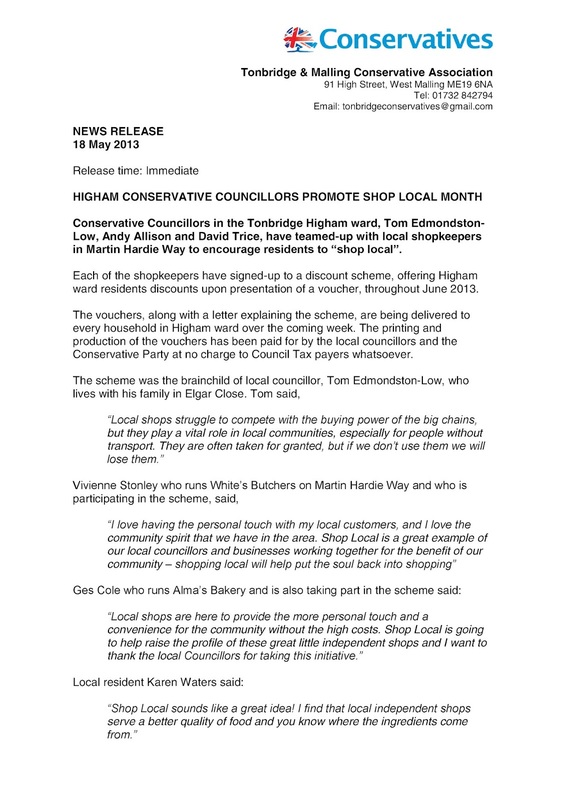 What a super initiative; it benefits the local shops by driving footfall, helps the local community be offering a discount; promotes the Conservative Party by demonstrating how we can add value and communicate with residents throughout the year and publicises the local team of Conservative Councillors who are active in their community. An all round win, I would say! Today was the first meeting of the small sub committee we have formed to organise next year's dinner, to celebrate Sir John Stanley's 40 years in Parliament. We had agreed to meet at Hadlow Manor, one of those privately owned hotels which specialise in coach parties of peach-sucking grannies touring the Garden of England. I shall refer to my two co-organisers as Miss Malt and Mrs Birch, which will at least afford them some modicum of deniability - though both mentioned they looked forward to reading about the meeting on this blog! Mrs Birch said she would pick me up, as the office is en route. She has a new car, having nagged the old one into submission. Hers was the only vehicle I have ever seen which had traded in its airbags for earplugs. She picked me up in West Malling car park. For some reason, despite 40% of the spaces being empty, Mrs Birch had parked blocking the roadway and the entrance to another car park used by local shop workers. "I don't like this new car, it doesn't move as fast as the old one and I can't even turn the radio off," were her opening remarks. I pressed the button with On/Off printed on it and off went the radio. "Oh, how did you do that? ", she enquired, as she reversed into an oncoming Range Rover and missed the local pharmacist's Mercedes by millimetres. As she played pot luck with the gears and we bounced along the road, she repeated, "it doesn't go anywhere near as fast as my old one," for which I was grateful. 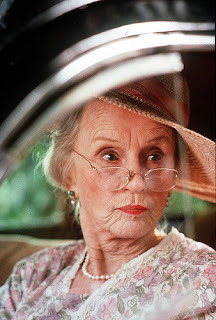 It was like Driving Miss Daisy - but in this case Miss Daisy was behind the wheel. Finally we arrived at Hadlow Manor and bounced to a halt. Miss Malt was waiting for us in the car park. There then followed a scene worthy of Fawlty Towers. We tried to get in through the front door, but it was locked. There was a sign reading, "Front Door Around the Side" and an arrow. We followed the pathway around the front of the old manor and down steps running horizontal with the restaurant, where a random collection of elderly tourists and local pensioners were finishing off their set lunch. The pathway ran into a brick wall. Faced with the indignity of retracing our steps with the rheumy-eyed diners watching us, we thought we'd brazen it out and pretend we intended to be there, having spotted a gap between three large potted shrubs which would take us towards the entrance. What we didn't spot was beyond the shrubs was a two foot drop. Quite what the diners thought of these two well dressed ladies of a certain age accompanied by a tall fat bloke, all trying to retain a modicum of dignity whilst clambering through bushes and navigating a 2 foot drop, we shall never know. Once inside and hidden out of harms way with a pot of tea, we started on the menus which had been provided by Tonbridge School. Many of the dishes were quite adventurous - never a good thing when organising a Conservative dinner. As many readers who have organised such events will know, planning a menu for 250 is a challenge. It's not so much selecting what people will actually like, more a case of eliminating what cannot be served, and hoping there's something left worth having. Out went the lobster tails, prawns and scallops (allergies). We said goodbye to the seared chicken livers (too rich) and the gravadlaz (the old boys will confuse it with a Norwegian sea-port). The main courses fared no better. Steak (some like it pink others well done), chicken (dull), baked sea bass (bones), confit of duck (digestion). Even the Romney Salt Marsh Lamb caused concern due to dentures. Then we faced the guest list, and in particular, who would participate in the proceedings. It was decided to be formal, with grace and a Loyal toast. "Do we have a friendly vicar?" "How about your Steve?" "He's a Socialist." "Oh, yes, that won't do." "How about (x)?" "Resigned over the gays." "What about (x) his father was a vicar?" "Not sure he actually believes in God." "Oh, does that matter in the Church of England these days...?" Finally, we were all done and dusted and saying our goodbyes, and once again I was in the hands of Miss Daisy and Chitty Chitty Bang Bang. As we travelled back to West Malling, I took a call. It was the future Mayor of Tunbridge Wells, phoning with a generous invitation to a celebratory lunch party at his home. As I was thanking him for his kindness, the air with filled with a string of shocking invective, which caught me and the caller by surprise. "Everything OK Mrs Birch?" I enquired. Apparently it was the man in the Audi behind - he was daring to flash as she wasn't driving fast enough. How dare he? 23 mph on a dual carriageway is fast enough for anyone ! Bloody cheek - if she was in her old car she would give him a run for his money! Do you have anything you would like me to buff-up! 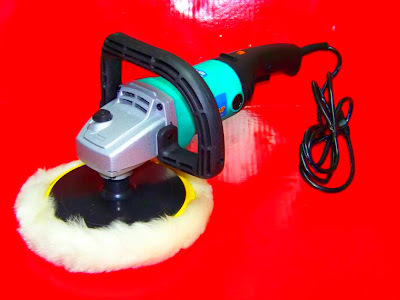 You know you have reached the stage in your life when you have everything you could possibly need when you ask your partner to buy you for your birthday an electric-powered oscillating boat buffer, with sheepskin polishing pads. I hope this clarifies the situation! Regular readers may have read a blog post a few days ago when I wrote about the difficulties of sailing a narrow boat on tidal waters, and I mentioned there could be an exciting solution ahead. Unfortunately, it was not to be. We had been offered a most wonderful residential freshwater mooring in scenic countryside with views across woodland and meadows. It was a significant distance from work and would have doubled our travel time, but it would have been worth it for tranquillity and the fact we would be on freshwater, and therefore able to untie the ropes and cruise away at weekends without worrying about tides and currents. The boatyard owner assured us he had planning consent for residential moorings, something tightly governed by local authorities for obvious reasons, especially on freshwater rivers. I was, however, a little dubious. Almost always planners will insist the marina supplies residential moorings with environmentally essential services, such as shower blocks, plumbed-in washing machines and sewage disposal. Obviously the authorities don't want unscrupulous boat owners to pump their sewage and detergents into a freshwater river, resulting in environmental damage. This particular boatyard offered no such facilities. Before signing the mooring contract, I decided to check with the local council.to ensure it was legal for us to be there. Clearly we have a duty to pay Council Tax and also register to vote, and should we have moved to a mooring without the necessary planning consents, as soon as we did either of the above, the Council would notice and could issue an eviction notice. Not ideal for someone was in the public eye! I called the local Council and was placed in a queue for their "Customer Advice Line". And waited. Apparently they were "sorry to keep me waiting, but my call was important to them." After 20 minutes the message changed. They were "experiencing an unusually high volume of calls". I was offered an alternative, I was invited to "press 1" to leave a message" and they would, "call me back as soon as a Customer Services Operator was available" and did I know that, "I could pay parking fines, council tax and other fees and charges online at www.xxxxxxxxx.gov.uk"
I declined the offer to leave a message as I wasn't wholly convinced that a council which was unable to answer a phone would have the skills to return a call. So I waited, and waited. After 1 hour and 10 minutes the phone was answered by Shane. I explained what I was calling about. Shane didn't have a clue, nor did he know who might advise me. I suggested the Planning Desk Officer, which he agreed might be right. I asked to be put through. It was now 4.15pm. Shane's exact words were, "I don't think it's worth your while, there are five people in the queue ahead of you for planning and by the time they get round to your call it will be after 5pm and they will have switch the phone off." At least he was honest! I asked what time planning opened, and was told 8.30am. At 8.20am I called again, this time using the planning department's direct line, which Shane had given me the previous day. Guess what, "my call was important, but I was in a queue and I would be connected to a planning officer as soon as possible." At 9.10am someone picked up the phone. I went through my story and gave her the exact address and postcode of the boatyard. I was placed on hold. I was now listening to Eine Kleine Nachtmusik, which is ghastly at any time, but at 9.15am is almost unbearable. 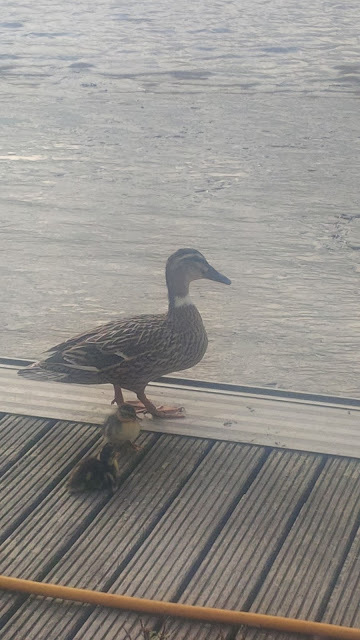 Fifteen minutes later she returned to inform me that the moorings at (location) did not have residential planning consent. "But I am not calling about the moorings at (x) they are 5 miles upriver and on the opposite bank. I am calling about (x) which are located at the road and postcode I gave you 15 minutes ago". "Oh, sorry, I have looked up the wrong file", she said. "Could you recheck please?" "Sorry, that's not possible. I have already spent 15 minutes researching for you, which is all I am allowed to do on the phone. If you want further searches you will need to contact our Business Unit and tell them what you want and they will inform you how much you will have to pay." The fact that she had incorrectly answered my original question by ignoring the information I had given her, was totally lost on her. Having now spent nearly 2.5 hours on the phone and spoken to two different people, neither of whom had the faintest idea how to answer my question, I tried a different route. I emailed a cabinet member I knew personally and explained the situation to him, and asked if he could obtain an answer for me. I don't like doing this, but I couldn't see any alternative. I wasn't asking for special favours or for them to change or amends a planning decision - all I wanted was a straightforward answer if the boatyard had residential permission. I was about to move to the district and pay them £1000 pa in Council Tax, I felt I had a right to know if it was legal for me to do so! …the moorings granted planning permission under (xxxxxxxx), although probably intended from our point of view as recreational moorings, may potentially have a consent for residential use by default of the conditions not precluding such use (although I would not take a firm view on this without consultation with the Council’s legal team). The riverside moorings had a clearly defined and conditioned temporary consent for 14 recreational moorings and 1 residential mooring, but no longer have planning permission for this, and may or may not be immune from enforcement action as this would require 10 years continuous use which cannot have accrued (unless the permission was not implemented in accordance with the consent which is a whole new can of worms I do not want to go into at this time!). The situation therefore varies depending on whether they could apply for a CLD on the basis that the 1995 consent does not preclude such use, or that the use of the land of the relevant berth has been used for such purposes for a continuous period in excess of 10 years. Alternatively, they could just apply for planning permission. However, whilst in a relatively sustainable location, the site is in the open countryside, and an ALLI, and obviously in a flood zone – given the history of the site, although planning permission might conceivably be granted, it would be by no means a certainty. This is obviously informal advice, and should not be relied upon in the submission of any application. I hope this clarifies the situation. Well, that really does clarify the situation! Given the necessary consent may, or may not, have been given, or may or may not be in existence due to continuous use, or may or may not be allowed by accident as constraints were not imposed originally, although this would have been in error, and the Officer doesn't know what might happen without further legal advice, which could, or could not, form the basis of an appeal, or for a future application which might or might not be granted, we have given up on the idea and will be staying put! 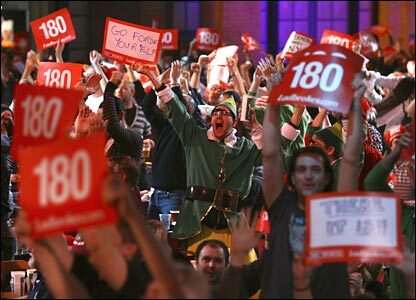 Saturday: All day meeting from 9am - 6pm at the Lakeside Darts Club in Frimley to hear 15 European hopefuls make speeches for the European selection. 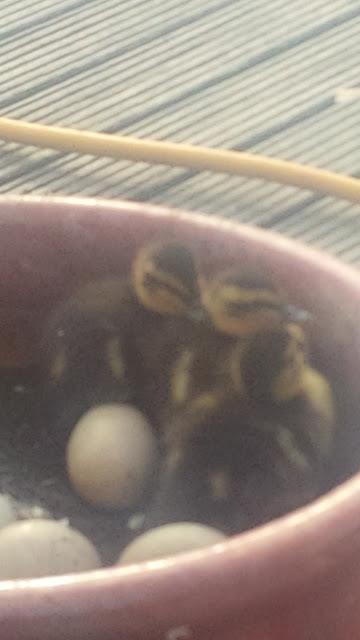 Six weeks after she laid her first egg, four weeks and two days since she started incubating, and just one day since they hatched, our family of ducks have fledged the nest. I was very fortunate to have been at home and looking out of the window when it happened, as the whole process must have taken 3 minutes. It was a wonderful to watch, and I managed to capture it on camera. Above: Without any hesitation she leaves her nest and parades up and down the pontoon, calling the ducklings to follow her. The first two follow quickly, wobbling across the pontoon on one day old legs. Their ability to walk and do so well, with no practice or training, is wonderful. Within a few steps they are running about confidently. Then there were three - the main obstacle appears to be the lip of the pot being slightly too high and too smooth to climb, but after a lot of clambering and peeping, they too manage it. 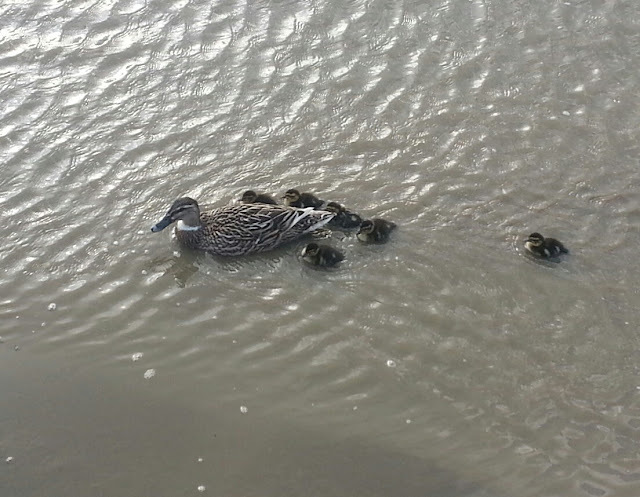 And off they go into the big deep river, just one day old. Hawks and gulls will try to eat them, the tide might sweep them away and the local swans will try to drown them - such is the cruelty of nature. It's been a great privilege to have a ringside seat. I have often wondered who "sets the tone" in a local authority with regard to the way it relates to those who live within its boundary. It never ceases to surprise me how different councils can be, even those in adjoining areas under the same political leadership. Do the Officers set the tone, and if so, what influence or control do the elected members actually have (bearing in mind they appoint the senior officers). Or is the tone set by the political leadership, and if so are some leaders really content with the level of service their council offers its taxpayers? 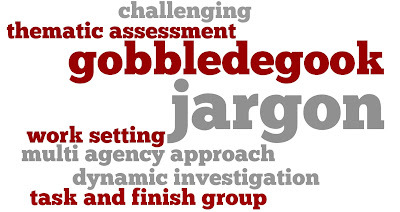 The three Associations I work for cover five local authorities, and my job brings me into regular contact with all of them, especially their Electoral Services Departments. All are Conservative controlled and all serve a reasonably compact corner of Kent. They recruit their staff using the same newspapers and serve similar communities. There is therefore no reason why the quality of service should differ? At the last General Election I was conscious that the instructions being sent to postal voters had changed, as had the format of the paperwork. Previously, the ballot paper, ballot paper envelope and declaration of identity were three separate items. The voter would complete the ballot, place it alone in the ballot paper envelope then complete the declaration, placing the ballot paper envelope and the declaration in the larger envelope to post back. Simple ! Then the system changed; the declaration of identity came attached (along a perforated line) to the flap of the ballot paper envelope. I can see why the change was made; to ensure the declaration didn't become detached from the ballot paper or get left out of the envelope thus invalidating the vote. However, not all local authorities changed to the new system, as some had a supply of the old envelopes and forms which they wished to use to save additional costs. At every election political parties contact their supporters who are registered for a postal vote to encourage them to return it; it's a perfectly legitimate activity and part of the democratic process. I was conscious, however, that with differing postal vote systems being used, our letter must match the advice being issued by each local council. If we indicated that the declaration was attached to the envelope when it wasn't (or vice versa) it would cause confusion for the voter, who would then start calling the Council for guidance and causing additional work for them at an already busy time. I discussed the issue with my Labour opposite number, who had also spotted the likely problem, and we agreed to contact the five local authorities to request an advanced copy of the instructions they were issuing, to ensure nothing we wrote contradicted them. I also suggested to the ERO that they copy their reply to all political agents to ensure fairness and minimise confusion. It was a pragmatic approach. Now, as ever, I am not going to cause ill-feeling or start finger-pointing, so let's call the five councils A B C D and E.
Council A responded to my email within 20 minutes, thanking me for my consideration and attaching a copy of their advice to voters letter, with copies sent to all candidates and agents. Council B did likewise, though their reply came after 3 hours. Council C took half a day to respond (still very efficient), however their ERO phoned me to clarify why I wanted the information and what I was going to use it for. Once I explained in more detail, he agreed and sent the details to me and the others. Council D didn't respond that day, but following a gentle reminder, they emailed the details with an apology for the delay. Which brings us to Council E. Council E didn't respond that day. Nor did they respond the following day or the day after that or..... for the next two days either. After five days I telephoned. The ERO wasn't available, but would call me back. No call. The following day (seven days after I originally emailed) I finally got through. No acknowledgement that they had failed to respond or return my calls. I had to explain again what I wanted. Where every other Council obliged, this one couldn't. I was asked if "the Electoral Commission had issued a guidance note to say if I was 'entitled' to see this information? Did the PPERA state that they had an 'legal obligation' to provide it?" Unless I could demonstrate the legal authority, the request would have to be referred to the Council's Head of Legal Services for an opinion. In the end, I gave up and sent my letter anyway. What circumstances made Council E so awful in the way it dealt with one of its internal customers? What must be the prevailing attitude in that authority which leads to a culture where a public servant adopts an attitude of "the answer is NO unless the law requires me to say yes?" Why is the level of service so different and does no-one question that difference? Did they do any customer satisfaction reports, and if so was action ever taken? Given the ERO reports to a Director, does he find this level of service acceptable, and if so, why? If not, what has he done about it (the ERO is still in place and still as bureaucratic and unhelpful as they were three years ago). Does the Cabinet Member responsible not ask or care, or is he so grateful to have an office and a nice desk and be called Councillor that he doesn't want to rock the boat? Do Cabinet Members ever ask themselves 'what is the point of having responsibility without power" and why they seek such power if they are impotent to bring about change? 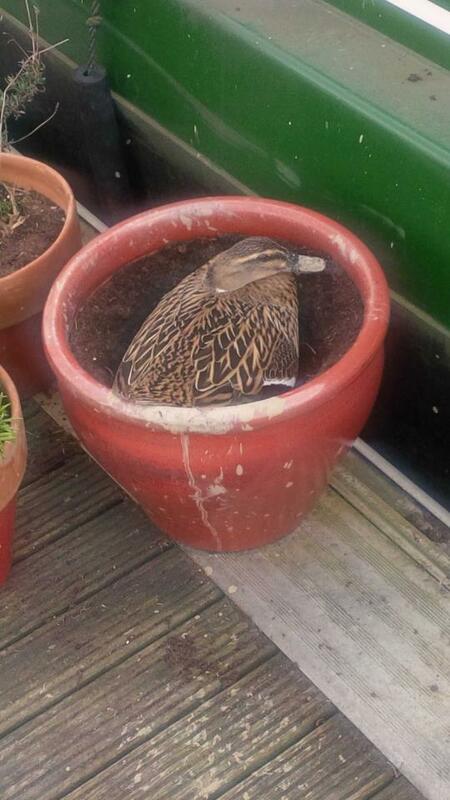 Mrs Duck has finally hatched her eggs - and at the time of writing five or six ducklings are snuggled underneath her, in our plant pot. According to our neighbour they started hatching this afternoon. 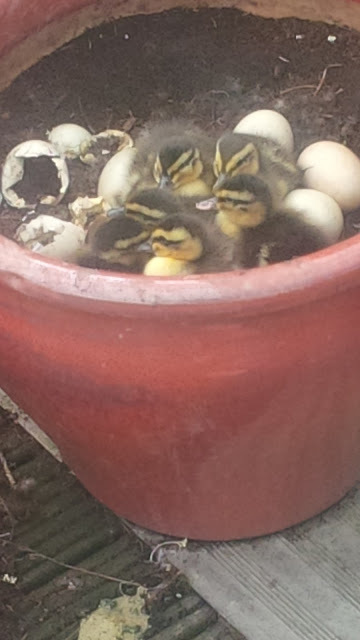 In total she laid 18 eggs, but I fear many may have died as they were laid before the last bout of frost. I don't want to get too close as she understandable gets very nervous and stressed if anyone approaches, but I will post photographs as soon as I am able to do so! Steve and I have been living on board for approaching 12 months now. It has truly been a great experience and has convinced us both that we would like to be live-aboard boaters for the foreseeable future. Yes, the winter was long, cold and challenging, and at times the walk from the car park to our mooring, in the freezing cold and with wind howling off the sea, was enough to test our resolve. We have made friends with our neighbouring boaters and it is nice to live in a genuine community, where people have time for each other and stop to chat and socialise. There has been, however, one issue which has dampened the enjoyment. We are both boaters and we love to sail. I have never understood the thousands of people who spend a small fortune to keep a boat but never move it out of the marina. And trust me, for every boat which moves, there are 30 which do not. However, being moored on a 'half tides' has made sailing very difficult. Allow me to explain. A half tide mooring means half the time we are floating and the other half we are on the river bed. You might think that all we need to do is wait for the tide to come in and sail off - but it's not quite as simple as that. Being a flat bottomed boat we can only go in one direction - inland towards Tonbridge. We simply don't have the power or navigation skills to take her out to the Thames estuary and towards London. Even if we did have those skills, we would face 12 long hours travelling before we reached the first safe haven - which is Gravesend. Now I don't wish to be rude about Gravesend as I have friends there (including the former MP), but a 12 hour journey in dangerous seas with the Pocahontas Museum and panoramic views of Tilbury docks to look forward to, is not the greatest enticement to travel! Going the other direction is a two hour journey to the lock at Allington, which separates the tidal river from the freshwater Upper Medway. However, that's two hours travelling with the tide, but that is in itself a risk as we need to calculate the size of the tide and speed of the water. Our boat can maintain around 5 knots, so if it's a big tide and the water coming into the river is flowing faster than 5 knots, we are basically carried along with no steerage or control. To avoid the risk we could leave as the tide is flowing out, but again if it's flowing out at 6 knots and we can only move forward at 5 knots, we end-up going backwards and we could end up in Antwerp (which is probably on a par with Gravesend without the added attraction of Pocahontas). To avoid this we need to ensure the days we have off coincide with small tides. Then we have the clock to consider. The tide comes and goes when it wants to, not for our convenience. So even if we both have the same days off, the weather is clement, and the tide if sufficiently low to make navigation possible, we also need to have the clock in our favour. 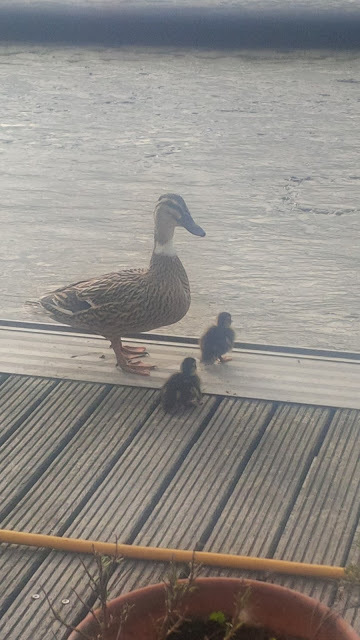 On the two occasions all the other ducks have lined up, the high tide has been at 7am (or 7pm) meaning we would have leave our mooring in the dark and travel in the dark - illegal without navigation lights (which narrow boats don't have!). As a consequence of these complications, we have simply not done any sailing since we moved here - which is a great disappointment to us both as we love it so much. But hopefully that might be about to change - as over the weekend an exciting and totally unexpected opportunity opened up to us, which could lead to a be a big transformation in how we live! I will post more tomorrow when hopefully things have been confirmed! There is a longstanding debate in local politics about the responsibility of candidates and councillors to meet their Association's political and campaigning objectives. Equally, should members of an Executive Council (ie, those who like to attend meetings and like run the affairs of the Association) also be expected to pro-actively campaign? Is it right that many councillors do all that is asked of them (with many doing more) whilst a small minority do nothing whatsoever, unless their own name is on the ballot paper? 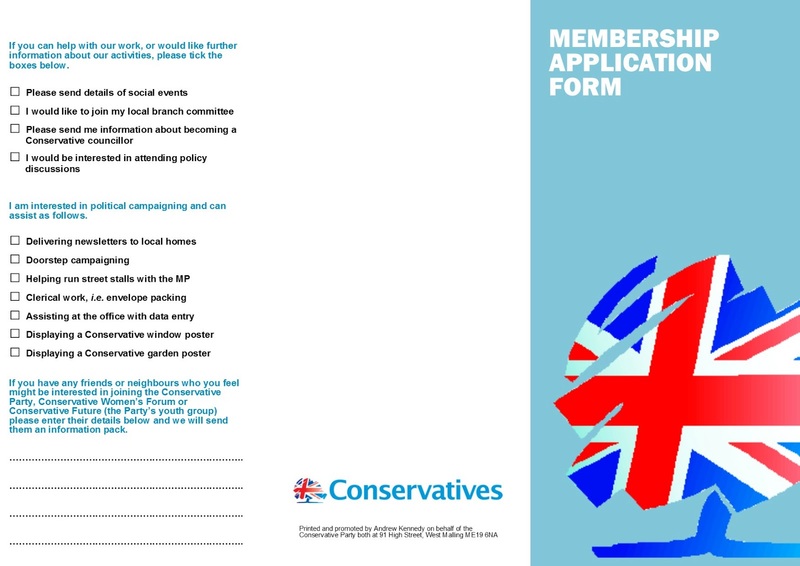 Should Associations demand councillors meet their obligations, as defined in the CCHQ Agreement (which stipulates that a candidate / councillor must contribute to the Association's campaigning objectives) or should we turn a blind eye to those who fail to campaign? All parties have councillors who stay "one term too long". Should Executive Councils / Local Government Committees be more pro-active by removing candidates who are clearly too old / infirm or ill, from the Approved List? Indeed, if such a councillor is too old to fulfil his or her campaign obligations are they not also too old to be effective local councillors? And are local political parties (of all colours) failing their communities by allowing such candidates to remain in office? These are difficult questions, and I would appreciate your views. Please click on the link below to answer these questions (seven in total). As always, the survey is anonymous and will be open until Sunday evening. Housing policy has always interested me. With the benefit of hindsight, I believe the post war planners are responsible for so many of Britain's social ills. The high rise estates with no communal or defendable space, the sprawling municipal estates, built on windswept hills on the edge of our towns and cities, which tore apart long-established communities and placed people in isolated dependency, miles from their social networks and jobs. If you think we have now learnt the lessons, think again. John Prescott's insistence on high density housing and limiting car parking spaces to 0.8 spaces per 'unit' is now creating new slums. If you need an example, take a look at Leybourne Park in Larkfield. Three hundred high density flats, with 200 car parking spaces between them with no shops or community facilities, and the few shared green spaces now used as car parks, as the people who live there need a car and have nowhere else to park. Many of the flats were sold to a London Housing Association, who have used the properties to house families from Lewisham, Deptford and Catford - miles from their families, friends and support groups. Many who have been moved here are from the BME community, and now find themselves in an isolated corner of semi rural Kent, where the local church is High Anglican and the shops don't cater for their needs. Is it any wonder communities don't develop and a sense of isolation takes hold? Travelling along the Upper Medway yesterday I saw many plush new riverside developments lining the banks of the river as we left Maidstone. The riverfront properties were nicely built, well designed and clearly desirable places to live. Yet tucked in the corner of each stylish new development were the "social housing units" which developers are required to provide as part of the planning process. The problem here is also too obvious. The builders, not wanting to scare potential high value buyers, will always build the private housing first, using the best materials on the most desirable land. The social housing will be built last, and given the budget allocated to the builders for this, will always be of poorer quality and high density. The potential problems are clear; hostility from freeholders who believe the social housing effects their property values and a sense of isolation from the tenants who feel they are "looked down upon" by their rich and snobby neighbours. Perhaps one solution might be to change the law to require developers to build social housing for retired people. I can see many advantages of this. Retired people as a rule are good neighbours. There are exceptions, but they generally don't have noisy parties, they tend to maintain their gardens, put their rubbish our the day the dustman comes, clear up their own mess and get along with each other. I cannot see residents objecting to 20 or 30 retirement flats built as part of the development, nor can I imagine the retirees feeling a great sense of social injustice or envy living next to the rich and wealthy. Furthermore, it is far easier for social services and the other agencies to provide services when people with a shared need live in close proximity. And here is the other advantage, we are short of family homes for rent yet and there are tens of thousands of older people, often living alone, in two and three bedroom houses. One of the complaints against the Bedroom Tax is there are insufficient one bedroom properties to move to. If developers were required to build retirement properties not two and three bedroom family houses as part of their social housing obligation, and older people were encouraged to move by providing assistance with removal costs and relocation expenses, suddenly tens of thousands of larger properties would become available for housing families. To me this seems a logical thing to do. It's those gays again !